Very durable and feature packed bugger - awesome quad for the price! No camera is a drawback though. Drones are a great way of enjoying yourself and today they are no longer just for the expert flyers and enthusiasts. 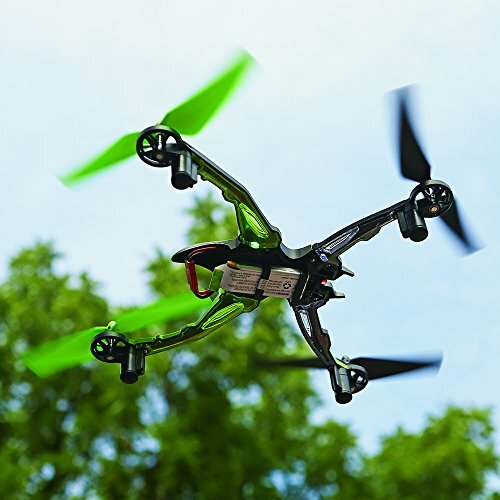 RC drones are as beginner-friendly as they’ve ever been because of advances in modern technology. After a successful ride with their remote control cars Dromida just got into the drone market and they released the Ominus drone. 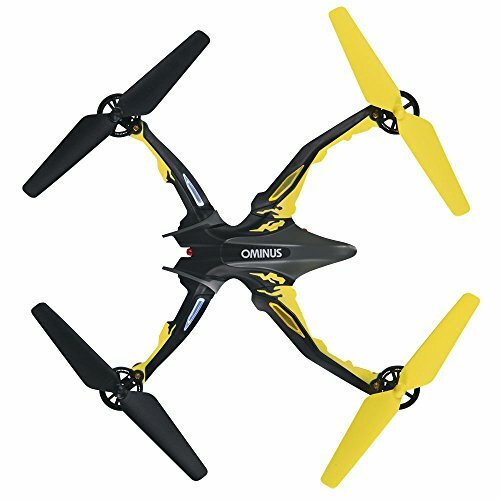 The Dromida Ominus is considered to be one of the best drones for the beginners who want to fly a drone. The Dromida Ominus comes with several different flight modes, relatively good flight time, and an aesthetic body that looks really beautiful and it is by far one of the more durable and almost unbreakable drones currently available on the market. We are going to go in-depth in this Dromida Ominus review, and show you everything that this drone has to offer. The Dromida Ominus has a sleek design that makes it unique and eye-catching while it is in the air. It features a predator-like appearance, which really helps separate it from other traditionally styled drones. The drone is below average in size and weight. As far as color goes, the Dromida Ominus is available in green, blue, red, and yellow and the extra set of blades are color coordinated to match the drone. The Ominus looks solidly built and manufacturer claims that their drone is “nearly impossible to break”. Everything on this quad looks like it can take a crash. The motor mounts are also the quad’s landing gear and they are covered with rubber pads. They help to absorb the shock from hard landings thus adding to its indestructibility. There are no blade guards to protect the propellers from bending or breaking. is well-protected underneath the drone’s body. The drone is equipped with five LED lights. They improve visibility in less-than-perfect weather conditions and they are also useful for night flights. The bright red LED lights in the rear are very useful for the novice. They will help with flight orientation so you know where you are flying. The LED lights are a definite must to keep a visual on your drone because there is no GPS on board. The Dromida Ominus is equipped with a nice 3.7V 700mAh Li-Po battery. 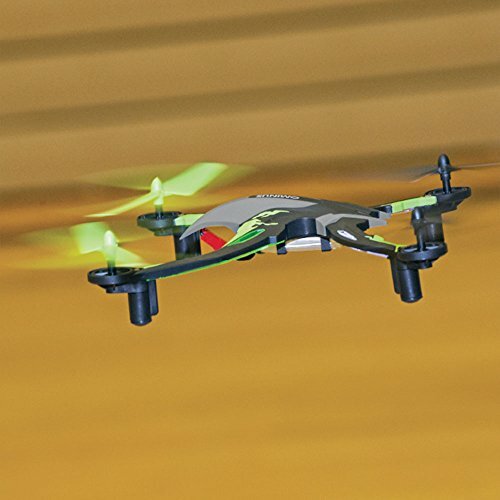 The drone uses an above-average sized battery to power its flight, compared to the average of 650 mAh. Charging time is about 50 minutes and the maximum flight time of the Dromida Ominus is about 15 minutes. This means that this drone can fly for a significantly above average amount of time compared to the average of 8 minutes. It is important to note that the flight time might drop to 8 to 10 minutes f you perform more flips during the flights. This means that the flight time might vary upon the aggressiveness of the flight. The battery can be charged via included USB cable. The Dromida Ominus does not come with a built-in camera. However, a new model was launched that does have a camera so now you can now fly and record live footage and capture photographs with that model. Turn on the drone and the transmitter before flying, wait a couple of seconds and you are ready to fly. The Ominus uses a 2.4GHZ 4-channel frequency and the drone can be flown up to 30 meters away from you using solely a remote control for operation.
. The right stick turns the drone to the right and left while the left stick moves it backwards and forwards. There are also two switches nearby, one for executing flips and the other is the F-mode switch (flight mode). Looking for a durable starter quad? Dromida has you covered with the super cheap Ominus. The Ominus is considered to be one of the best drones for any skill level. The drone can perform flips, rolls, and twists with a simple press of a button. Being able to do acrobatic tricks like these will certainly make you look like a much more experienced pilot than you really are. 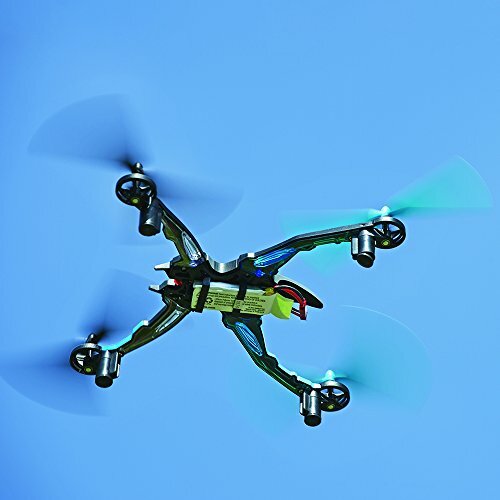 It is recommended that you perform these tricks indoor or when outdoor breezes aren’t present because the drone can be a little unstable in heavier wind conditions. The Ominus comes with gyro stabilization, high-powered motors and it can fly in six directions. It is important to note that flight assistance can be turned off for full manual control. The Ominus allows you to experience a relatively smooth and stable flight with plenty of potential speed and agility. There are four basic flight modes for the Ominus that can be adjusted to suit your experience level. These flight modes are easy, normal, advanced and expert and they can be activated using the F-mode switch. To choose the desired mode you need to push the switch and hold down the right stick. Dromida Ominus Review - Tough as Nails? Here we have Dromida's Ominus quad copter. Excellent flying and very durable. The easy mode is for the absolute novice. In this mode the drone practically flies itself with minimal input from the flyer. The normal mode lets your drone fly a bit faster and manoeuvre a little tighter. The advanced mode is for intermediate flyers. They have a grasp on how to fly but they still need some help from the flight assistance feature. The expert mode deactivates the flight assistance feature completely and gives the flyer a hundred percent control. Some users have reported that they find it difficult to determine what flight mode they are in without glancing down on the transmitter. This can be really dangerous because you are taking your eyes off the drone. That’s why, it is advised that you avoid changing flight modes mid-air. It is recommended to change them while the drone is still on the ground. The Dromida Ominus is perfect for any beginner pilot who wants to hone their skills. 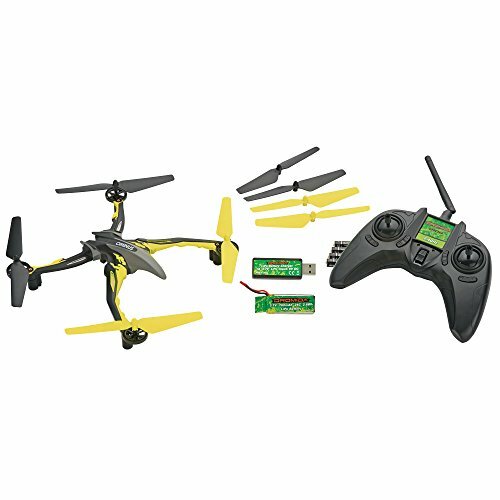 It is considered one of the best Sub $100 drones currently available on the market. It’s a great price tag for its wide range of features and specifications. The Ominus is definitely of the more durable and almost unbreakable drones and it has taken away the newbies’ fear of crashing and burning their investment. It is also very important to note that the spare parts are affordable and easy to find. The only downside is that the drone isn’t equipped with a camera. 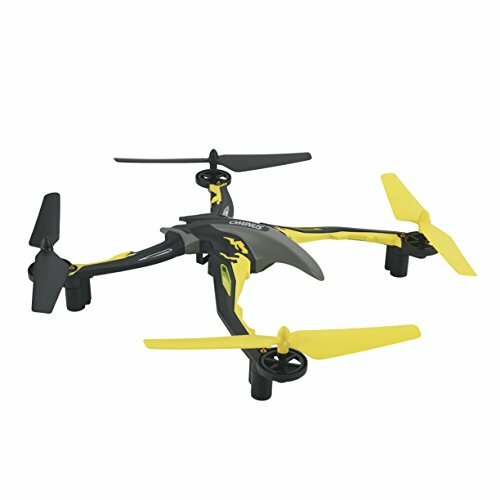 On the other side, this small drone has many amazing features, such as durability, sleek design, easy-to-use controls and a decent flight time. These features make the Dromida Ominus highly competitive and definitely worth a try.